Geek Lit Etc. : Manga Monday: Why won't anyone open the door? 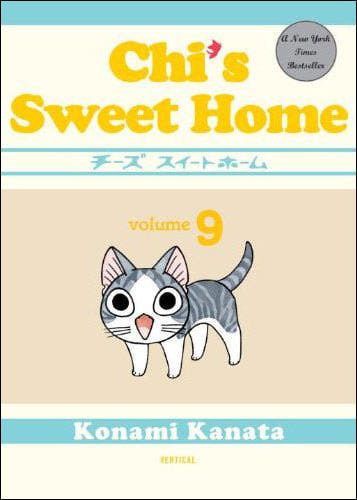 After the events of Volume 8, Chi's parents are very worried about what trouble Chi can get into outside. When her Elizabethan collar comes off, Mommy and Daddy decide to raise Chi as an indoor cat and close the sliding door to the yard. Unsurprisingly, this does not go over very well with Chi, and she just can't seem to understand why no one will open the door for her. Will Chi finally understand that the outside is just too dangerous for a little kitten like her? Daddy feels horrible that Chi is so sad. He knows that it's not a good idea for her to go outside by herself, though. But when he sees David as his dog go for their walk, he gets the great idea to buy a leash and collar for Chi. Chi is not exactly used to not going wherever she wants outside, and doesn't approve of this 'leash' idea one bit. Can Chi learn to deal with this new restriction? Since Chi can't go out as much anymore, eventually Cocchi makes a visit to the Yamada house. After awakening in Chi's living room, he's repeatedly astounded by the lazy life Chi leads. Things like playing with Youhei and having one's food delivered starts to grow on Cocchi, however, and perhaps he could get used to the indoors life. Once again, we see more and more of the neighborhood cats as the series progresses. Both Blackie and Auntie make appearances, as well as the tabby mother cat we've seen before. Even Cocchi mistakes one of her kittens for Chi at one point. This time, after she sends her kittens into their den for the night, she calls out into the night, as if looking for someone she's missing. 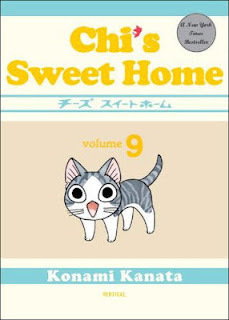 As always, Chi's Sweet Home Volume 9 does an impressive job of tempering its cuteness with reminders of real life and the loss that comes with time. Highs: I've tried walking cats on a leash before, with about the same results as Daddy. Lows: It's a little sad seeing the life that Cocchi leads outside as a stray. Verdict: More adventures of our favorite little kittens, and while the premise seems like it should get old, it never seems to.